Midfielder Andrew Shinnie was relieved to finally be over the niggling ankle injury and back on the pitch once more for Luton at the weekend. 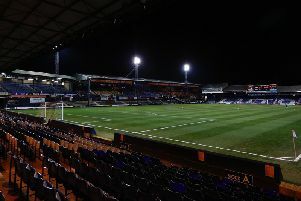 The on-loan Birmingham City player had been forced off against Chesterfield last month with the problem, and then had to sit out the following seven games, with Luton going unbeaten in that time. It’s obviously frustrating and more frustrating seeing the lads doing really well and you’re not contributing, it doesn’t feel right. Shinnie admitted it was tough to watch on from the sidelines, but he had to make sure he was fully fit before attempting to return, saying: “It’s been really frustrating, but I had to do it for my ankle or if I kept coming back too soon it probably would have kept happening. “So I had to just take a few weeks off to strengthen it up. “It’s obviously frustrating and more frustrating seeing the lads doing really well and you’re not contributing, it doesn’t feel right. Shinnie had starred at the start of the season for Town, with a number of assists, in particular for James Collins’ goals. He has been impressed with how the squad has done in his absence too, as he continued: “I was in a rhythm as it was, but injuries are part and parcel of football. “It wasn’t a massively bad one, I just had to take a few weeks out to get it better. “I’ve just been watching the boys and they’ve been doing the business, it’s been a happy camp, so I’ve not been down with the boys around me. “It’s been good fun and obviously frustrating on a Saturday afternoon, but now I’m back and I enjoyed it out there. The 28-year-old almost enjoyed a goalscoring return at the weekend too as with Luton trailing 1-0 down, he volleyed goalwards from Dan Potts’ header, only to see keeper Lee Burge pull off a decent stop with his legs. Shinnie said: “It was tough coming on when you’re 1-0 down and you’re trying to make the difference. “I felt quite good out there and just really disappointed as the goalie, I don’t know if he knew too much about it. “I caught it quite well, maybe too well, the volley and it just came back off his leg. “It came over my shoulder, they’re sometimes difficult ones to get right. “Sometimes you’ll catch it sweet, sometimes it will go over the bar, or maybe you’ll scuff it and it’ll go in, or maybe if I hadn’t caught it as well it would have gone in. Meanwhile, captain Scott Cuthbert was pleased to see his team-mate back in action, adding: “I thought Shins looked really bright when he came on. “He’s had that volley and been really in the mix for everything we were doing, coming to get the ball off the back four and tried to open them up. “I’m absolutely delighted for Shins, he’s obviously frustrated that he came out at the wrong time, not through his own choice, but his ankle, he had to get that right.